R.O. Steel Roofing is proud to support the Exodus Foundation, a registered charity that combats disadvantage in its many forms. The Exodus Foundation provides food, educational, social health and well-being services without discrimination to those who need it most. Until 31st March 2015, R.O. Steel Roofing will donate a portion of the revenue generated from any new job to assist the Exodus Foundation provide real assistance to poor and needy Australians. Exodus’s food and social health program began with the Loaves and Fishes free restaurant at Ashfield, and this remains the focal point and base for all the organisation’s food services. The restaurant begins serving breakfast at 9am every day, and provides a healthy and nutritious morning meal for around 250 guests from the local and surrounding areas. Hot lunch is served to an average of 300 guests daily between 11:30am and 12:45pm, seven days a week. 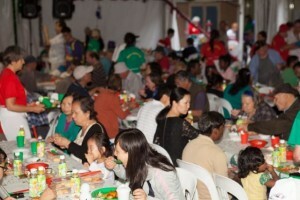 In 2009, the Exodus Foundation took over a mobile food van service from the Just Enough Faith (JEF). Each night, this specially-equipped van takes hot food prepared at Loaves and Fishes to Yurong Parkway, Woolloomooloo, near St Mary’s Cathedral. This service provides a hot dinner to the poor and homeless serving between 150 and 200 people each day, between 7:30 and 8:30pm. 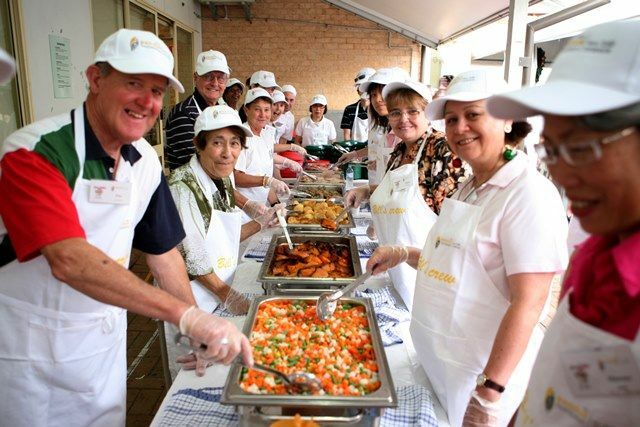 On Christmas Day the Exodus Foundation will host a special Christmas celebration in Ashfield and will feed almost 3,000 hungry people! Through donation, R.O. Steel Roofing helps make it possible for the Exodus Foundation to provide homeless and disadvantaged people with a hot Christmas lunch and some joy this 25th December 2014.In addition to the financial support provided, R.O. Steel roofing donates gifts and goodies for Christmas hampers to brighten the festive season for those who need it most. From 1996 – 2014 Exodus operated two literacy centres in Sydney, in the Sydney suburbs of Ashfield and Redfern. The intensive teaching, provided by literacy experts, was based on the MULTILIT (Making Up Lost Time In Literacy) program developed for low-progress students in years 4 to 6. By combining small class sizes with special techniques and intensive, systematic training, these programs helped bring students up to speed with their peer group in a short space of time. The Exodus Foundation’s literacy program has helped close to 2000 students from 112 primary and high schools. The program took more than 150 students at its Ashfield and Redfern centres annually, bussing them in for a two hour session five days per week over a period of 18 to 20 weeks. R.O. Steel Roofing attended the centres graduation ceremonies to meet and celebrate with the children who benefited from the support provided to this program.